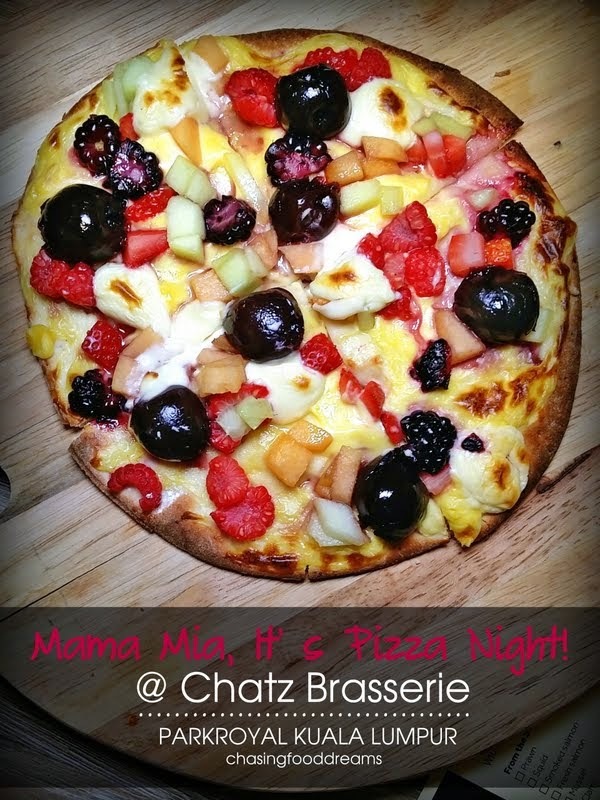 CHASING FOOD DREAMS: Chatz Brasserie, PARKROYAL Kuala Lumpur: Mama Mia, its Pizza Night! Chatz Brasserie, PARKROYAL Kuala Lumpur: Mama Mia, its Pizza Night! It’s a Haven of Pizza! Not just any pizza but all-you-can-eat plus a takeaway too! The icing on the cake is you get to say what goes into your pizza. 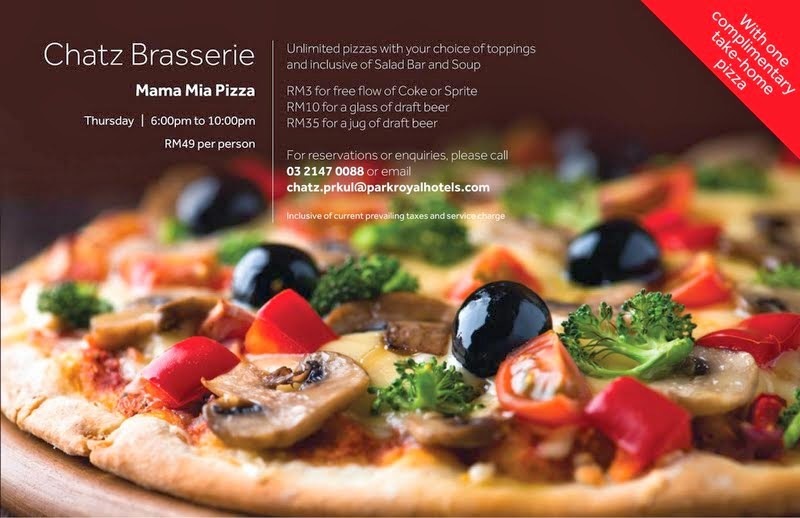 I am back again at PARKROYAL Kuala Lumpur at Chatz Brasserie for their Mama Mia Pizza promotion. Available only on Thursday nights from 6.00pm to 10.00pm, this promotion also comes with unlimited helpings from the salad bar and soup of the day. As soon as I arrived, it was hard not to be drawn immediately to the pizza bar. Over 30 bowls of ingredients are just beckoning to go into the pizza base. 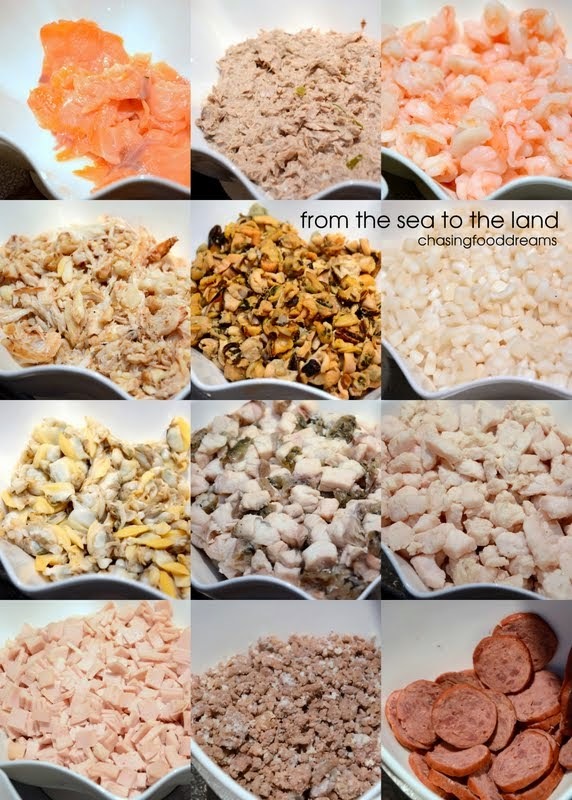 From the sea to the land, we have lots of seafood, meat, sausages, pepperoni, and vegetables together with a few types of cheese and sauce. Once you had a look at the ingredients, you might be thinking on how to pile all these ingredients on your pizza just like me! Whatever you do, make sure to save room for dessert pizza! Check out the gorgeous colors of fruits and sauces to go onto the dessert pizzas. Lots of berries and melons are brilliantly paired with custard, crème anglaise and cream cheese sauce. The dessert pizza is truly and simply a must-have!! We were handed a printed menu to make our choices for each pizza. Simply select your choice of ingredients, sauce and cheese, hand it over to the wait staff and head over to the salad bar or soup to start your meal. The Soup of the Day rotates each week and this week, it was creamy and earthy thick mushroom soup. I love the flavorful mushroom soup and had mine with some croutons and a slice of bread with Almond Butter. The flavored butters are really good so make sure to slather these on your bread. The Salad bar is filled with lots of vegetables and dressing. I piled up mine together with some pickled vegetables and dressing. Though nothing to shout about, the bar does have a sufficient choice of salad. My Seafood Pizza had crab, prawn and clam on tomato sauce with mozzarella, emmental cheese and chili flakes. The base was lightly crisp and thin. The tomato sauce was lovely and fresh. Both mozzarella and emmental cheese was pretty mild so it won’t overpower the seafood. The little chili flakes provided bits of heat to the pizza which I really enjoy. I had another one filled with seafood too and this time with salmon but with a pesto sauce and stronger parmesan and cheddar cheese. I really like the stronger flavor notes of the herb pesto. It does take over the seafood a bit but I think the smoked salmon went very well with the pesto and strong cheese. There is a Satay Chicken Pizza by another foodie and its really quite unique and good. The satay sauce is really yummy and localized the pizza pretty well. There are more pizzas actually but I lost count of the variations. I saved the best for last. As mentioned earlier, you must, I repeat must have a Dessert Pizza. The combination of fresh berries and melon with all the 3 sauces are just to-die-for. It’s my first time having dessert pizza and I am hooked. There is just something so deliriously awesome about fresh, sweet, luscious and creamy hot dessert pizza that rocks. The black cherries on the pizza are just so fabulous. Correction, everything on this pizza is just so fabulous!! Mama Mia Pizza promotion is available for dinner on Thursdays only and is priced at RM49nett inclusive of Salad Bar and Soup. To quench your thirst while enjoying your own crafted pizza, add-on RM3nett for free flow of soft drinks or RM10nett for a glass of draft beer or RM35nett for a jug of draft beer. Don’t forget to order to pick up your take home pizza of your choice on your way out! Its a scam! went all the way there last thursday to find out that RM49 is only entitled for 1 pizza dine in and 1 pizza take away. All the brochures clearly printed "unlimited pizza with any choice of toppings" but they still argue that the "unlimited" only for unlimited toppings not unlimited pizzas! Even showed them various blogs promoting this, the manager in charge still say no, thats not the case. Got scam for RM6 parking as well! Ended up didnt dine in there, no wonder the restaurant was totally empty!